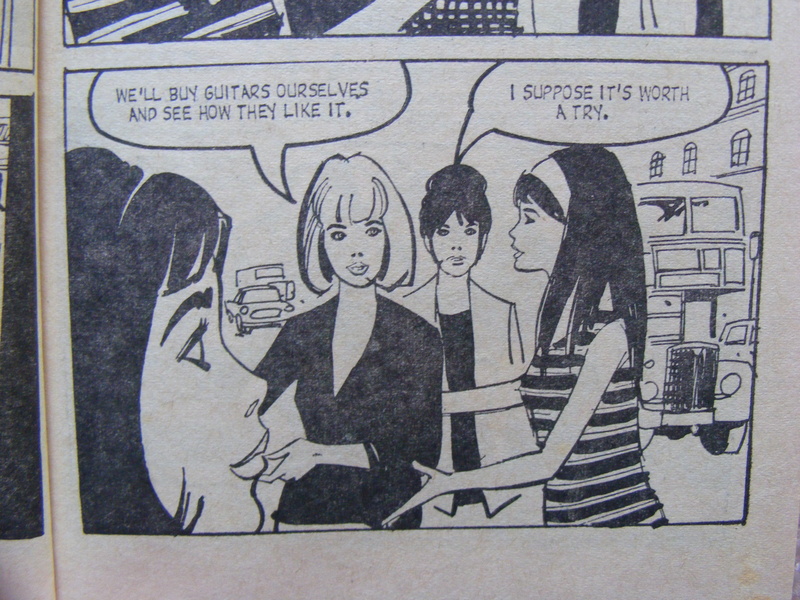 From early in 1965, teenage girls who had a love of pop music and cartoon romances had a new magazine to reflect their interests. The Pop Pic Library was published twice monthly in the pocket-sized ‘Picture Library’ format: 64 pages and a painted front cover, plus a photo on the back cover of the band whose song had provided the title for the individual issue. There is scant information available about the lifetime of the magazine, but it’s clear from the songs that were used that it started up sometime in the spring of ’65: issue 1 is called ‘The Last Time’, which was a hit for The Rolling Stones in March of that year; issue 2 is called ‘A World of Our Own’, which got to number 3 for The Seekers in April 1965 and so on. The titles of issues have very little bearing on the stories within, by the way, and are simply an opportunity to latch on to the success of a chart hit and publish a photo of the band in question on the back cover. The front covers are a story in their own right, but more on that later. The stories in Pop Pic Library are set in or close to the world of music. The narrative of issue 1 is typical. Carol is a devoted fan of the band Wayne Gray and his Wild Men. When the opportunity to apply for a job as their secretary comes along, she leaps at the chance. Carol gets the job. Wayne himself is supposed to be dating Marilyn, the daughter of the boss of his record company, but clearly has a roving eye and when he starts going out with his new secretary, Marilyn gets jealous. To get back at Marilyn, Wayne breaks with the record company and sets up by himself, taking Carol with him, and she becomes “manager, agent and secretary all rolled into one.” But there are soon signs that Wayne’s success is going to his head, and to the dismay of the producer he cries off from performing with his band on a big TV show. Enter Mark, the man who as Wayne’s manager had given Carol her job in the first place and has been kind to her throughout. He takes Wayne’s place on the TV show as The Wild Men’s new singer and is a roaring success. 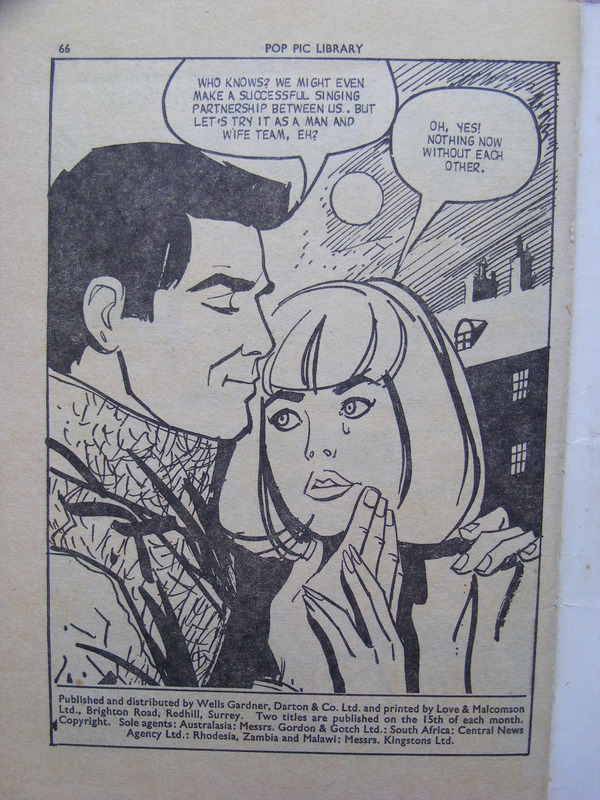 But Mark is only interested in Carol, and on the penultimate page he proposes to her. You’re just a seven-day wonder who’s got to the top the easy way. Just because you can warble a few corny songs, ably assisted by a few amplified guitars, you’re the biggest thing in show-business! 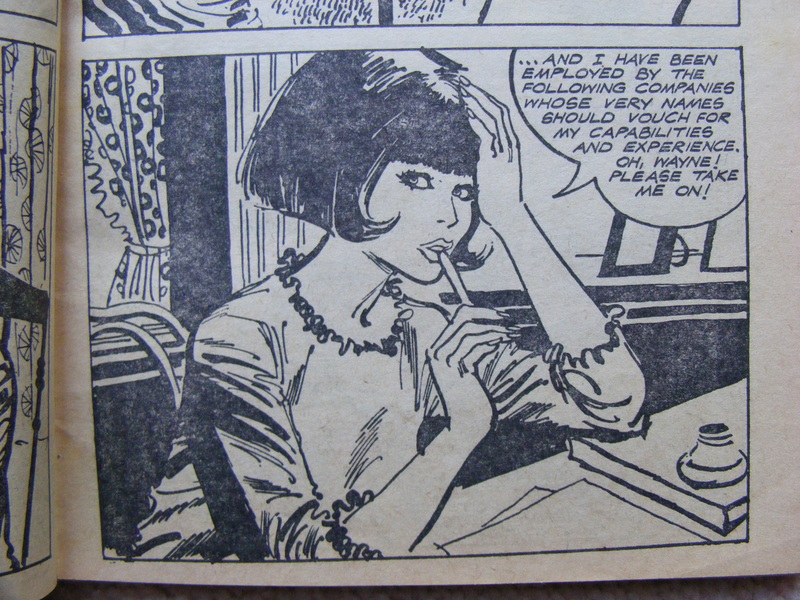 As a reflection of the times in which it was published, the comic comes into its own in its portrayal of young women. In ‘The Last Time’, Carol is good at her job and accordingly makes her own important contribution to the world of pop, even if the conclusion to her story is the predictable happy-ever-after one. The set-up of the story in issue 20, ‘As Tears Go By’, is anything but predictable. It opens with a group of girls marching on the local dance hall with banners proclaiming ‘DOWN WITH BEAT’ and ‘THE GUITARS MUST GO’. The problem is that their boyfriends all play in bands and can only think of music, which means that the girls feel like they’re getting a raw deal. The initial solution to this comes from the unlikely source of Aristophanes. Vickie, the protagonist, explains the plot to her friends. But not even Lysistrata can help them, as the boys simply play it cool when the girls “withhold their affections”. So the girls set about getting their own guitars and learning how to play them, and Vickie again uses the powers of sexual attraction to her own advantage by wearing a revealing dress to help her persuade the manager of the dance hall to put on her band. The girls are very successful, and Vickie attracts the attention of a TV director, who encourages her and is keen to spend time with her – but only so that he can secure lucrative contracts for himself off the back of her talent. By this stage the other girls have gone back to their boyfriends, so Vickie appears to be left with nothing, until her own boyfriend comes back to her and she tearfully begs him “to forgive her foolishness”. And of course they plan to get married. This is all so odd that it’s difficult to draw any conclusions from it, other than the usual message about the cruelties of the entertainment industry and the necessity of a happy ending. But in the first half of the story at least, it’s Vickie who makes the decisions and helps her friends understand they should speak up for something better for themselves. 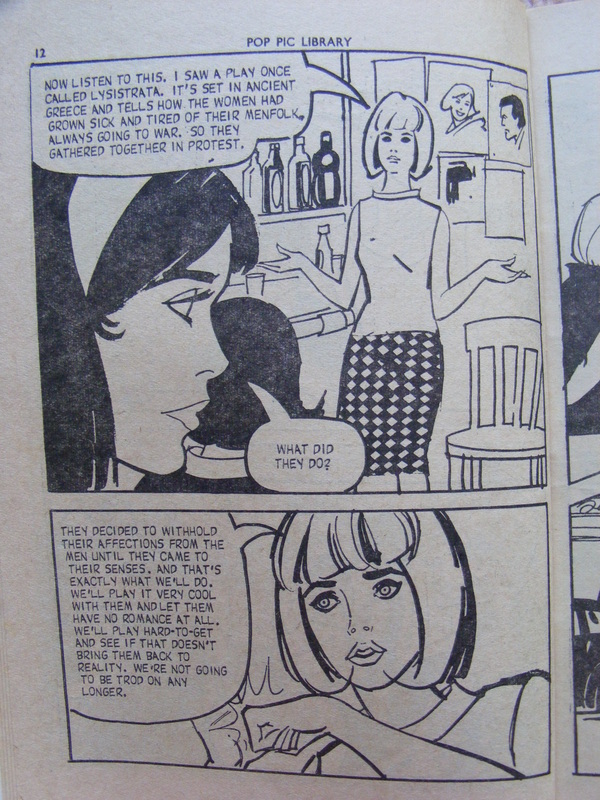 Even if the begging-for-forgiveness scene confirms she’s not quite a proto-feminist, Vickie has nevertheless seen Lysistrata and understands how she might be able to apply it to her own situation. And the panel in which the girls decide to form their own band (below) sends a brilliant message to the comic’s young female readership. 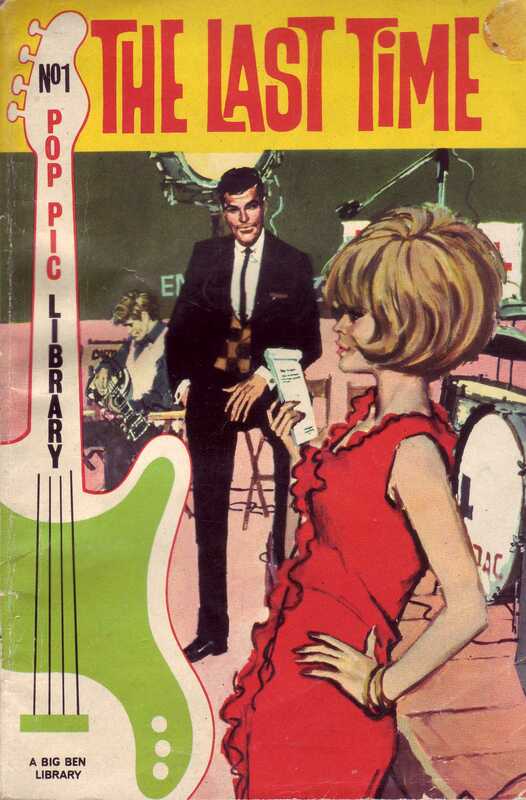 Most of the cover illustrations for individual issues of Pop Pic Library are uncredited, although a number were painted by Ángel Badia Camps, a Spanish artist whose work had featured in numerous comics and magazines including Valentine, Roxy and Serenade from 1961. Artists from mainland Europe had helped to fill a shortage in the British illustration industry from the mid-1950s, and the Spaniards came to dominate the romance market. Badia has found a new generation of fans in recent years, and in particular, the comic artist and historian David Roach has helped draw attention to his work. He has described Badia as “unquestionably the best” of the Spanish artists working in this area, his romance covers “the very epitome of 1960s nouvelle chic.” You can read the first of a series of posts here which David Roach has written about Badia for the Today’s Inspiration blog. And if you’re really keen, seek out his longer article about the artist in issue 1 of the (subscriber-only) quarterly magazine Illustrators. To see more of these covers in glorious detail, click on the link for page 2 at the top of this post. Have really enjoyed the pages, brings back good music memories! Can you PLEASE contact me as i’d really appreciate to know where the Advert for the BBC release of (Whatever Happened To The Likely Lads) came from? Was this advert featured in Radio Times? If yes, would you happen to know which year and issue please? Hello Ron – Thanks for the comment. Glad you’re enjoying the site! The advert was originally in a copy of the magazine I wrote about last month, called ‘Easy Listening’. 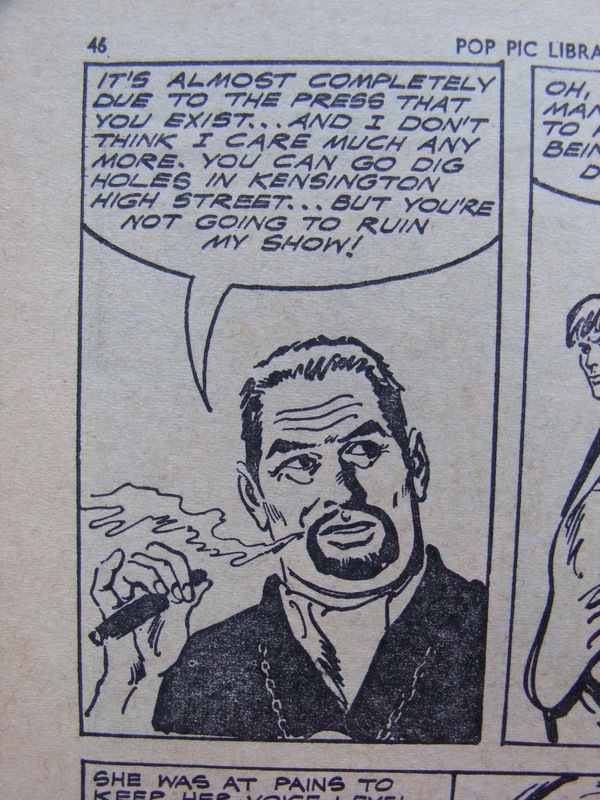 It appears in issue number 5, dated May 1973, which has a picture of Petula Clark on the cover. By the time this issue came out, it had incorporated a second title, so to give it its full name as it appears on the cover, it’s ‘Easy Listening featuring Living with Stereo’. It seems to be a reasonably obscure magazine; I struck lucky on eBay, buying a single issue initially, and then winning a job lot which gave me a complete run. But other copies have come up since, so I’m sure it’s worth looking. Scroll down to this comments section of the post and you can see a partial checklist for the whole series. More copies of the comic have appeared on eBay in the last few months, so with luck it may eventually be possible to put together a full list. I’ll post up covers of any further copies I acquire. These are fantastic! What is the name of the artist? Hi Michael – a number of them are by a Spanish artist called Ángel Badia Camps. There’s more about him in the last para of page 1 of the post.